The Australian Museum is Australia's oldest museum at over 200 years old. My twin brother, Dr. Hugo Anderson-Whymark, visited in 2012. The collection benefits from the curation of T. Hodge-Smith (from 1921) and R.O. Chalmers (from 1945 to 1971). ABOVE: The tektite display. 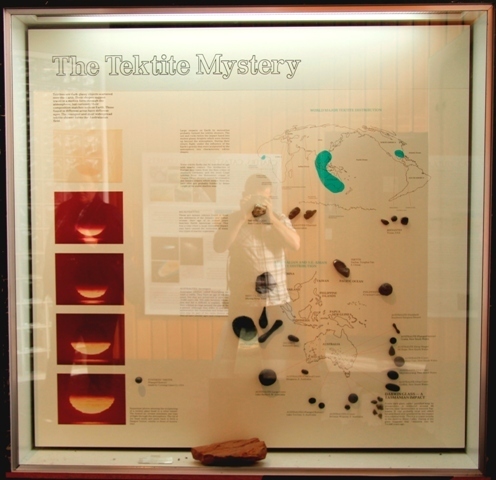 An interesting display from a historical perspective, but of course the word 'mystery' is not favourable given the current understanding of tektites. 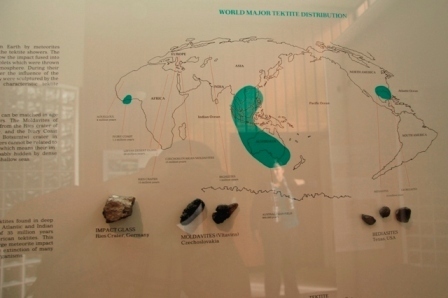 ABOVE: A dated tektite distribution map, along with some Central European moldavites and North American bediasites. 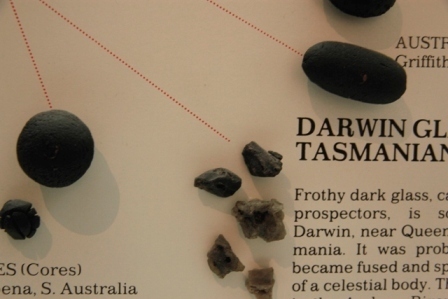 ABOVE: Australasian tektites plus Darwin impact glass. Wow, what a treat seeing this synthetic flanged button. Experimentation offered proof that Australite buttons had passed through the atmosphere at high velocity. It was reasonably concluded (from Australite buttons alone) that most probably tektites had a lunar origin. We now understand velocities to be slightly lower, the angle of re-entry to also be low and that the primary body was not a perfect sphere, but slightly flattened at the point of re-entry. ABOVE: A close-up of the Darwin glass. ABOVE: A rare treat! 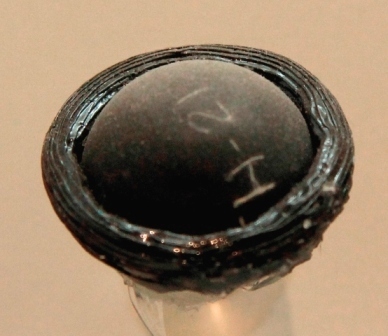 A synthetic tektite. Refer to Chapman et al. (1962) and Chapman (1964) for details of similar experimentation. ABOVE: Shatter cones from Gosses Bluff Crater, N.T. 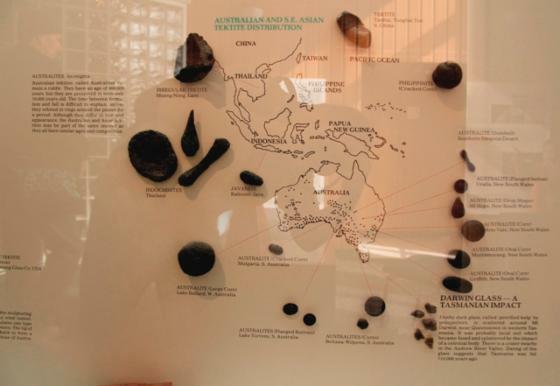 If you have any more images I can publish of the tektite displays at the Australian Museum in Sydney, you can contact me at [email protected] Thanks!